The Province of Naples is a mixture of colors, culture and history. The beautiful islands that dot the blue waters of the Mediterranean are like jewels in a necklace. In a sea so blue that it blends with the sky, three islands can be found: Capri, Ischia and Procida. Mt. Vesuvius overlooks the city and the beautiful bay. The sites of Pompeii and Herculaneum are of great archaeological value and are famous worldwide. The entire area is interspersed with finds from a long-ago past, especially those that saw the presence of the Roman emperors that first recognized the beauty of this terrain. Naples is one of the oldest continuously inhabited cities in the world. Bronze Age Greek settlements were established in the area in the second millennium BC and Naples played a key role in the merging of Greek culture into Roman society. Naples remained influential after the fall of the Western Roman Empire, serving as the capital city of the Kingdom of Naples between 1282 and 1816. Later, in union with Sicily, it became the capital of the Two Sicilies until the unification of Italy in 1861. Naples has the fourth-largest urban economy in Italy, after Milan, Rome and Turin. It is the world’s 103rd richest city by purchasing power and the port of Naples is one of the most important in Europe with the world’s second-highest level of passenger flow, after the port of Hong Kong. Numerous major Italian companies are headquartered in Naples. The city also hosts NATO’s Allied Joint Force Command Naples, the SRM Institution for Economic Research and the OPE Company and Study Center. Neapolitan cuisine took much from the culinary traditions of the Campania region, reaching a balance between dishes based on rural ingredients and seafood. A vast variety of recipes are influenced by a local, more affluent cuisine, like timballi and the sartù di riso, pasta or rice dishes with very elaborate preparation, while some dishes come from the traditions of the poor, like pasta e fagioli (pasta with beans) and other pasta dishes with vegetables. Neapolitan cuisine emerged as a distinct cuisine in the 18th century with ingredients that are typically rich in taste, but remain affordable. The majority of Italian immigrants who went to the United States during the great migration were from southern Italy. They brought with them their culinary traditions and much of what Americans call Italian food originated in Naples and Sicily. Naples is traditionally credited as the home of pizza. Pizza was originally a meal of the poor, but under Ferdinand IV it became popular among the upper classes. The famous Margherita pizza was named after Queen Margherita of Savoy after her visit to the city. Cooked traditionally in a wood-burning oven, the ingredients of Neapolitan pizza have been strictly regulated by law since 2004, and must include wheat flour type “00” with the addition of flour type “0” yeast, natural mineral water, peeled tomatoes or fresh cherry tomatoes, mozzarella cheese, sea salt and extra virgin olive oil. 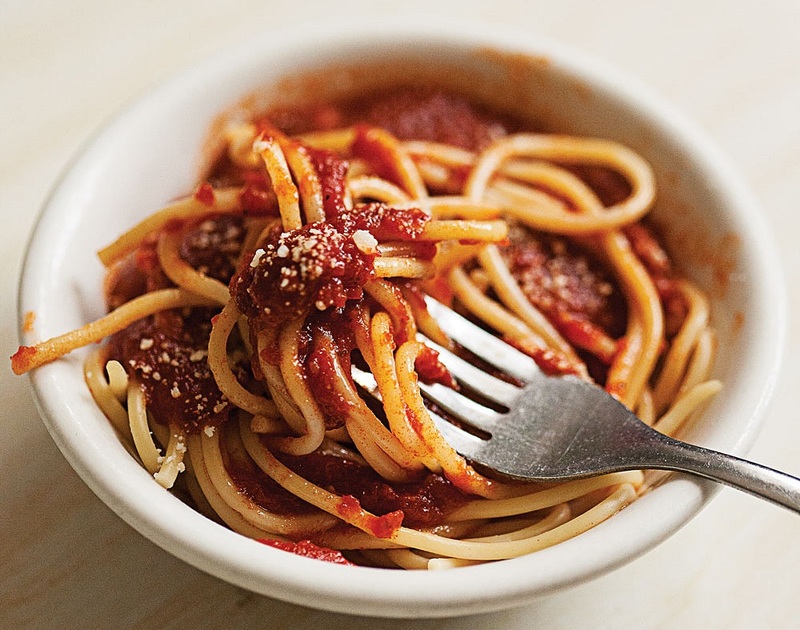 Spaghetti is also associated with the city and is commonly eaten with a sauce called ragù. There are a great variety of Neapolitan pastas. The most popular variety of pasta, besides the classic spaghetti and linguine, are paccheri and ziti, long pipe-shaped pasta usually topped with Neapolitan ragù. Pasta with vegetables is also characteristic of the cuisine. Hand-made gnocchi, prepared with flour and potatoes are also popular. Other dishes popular in Naples include Parmigiana di melanzane, spaghetti alle vongole and casatiello. As a coastal city, Naples is also known for its numerous seafood dishes, including impepata di cozze (peppered mussels), purpetiello affogato (octopus poached in broth), alici marinate (marinated anchovies), baccalà alla napoletana (salt cod) and baccalà fritto (fried cod), a dish commonly eaten during the Christmas period. Popular Neapolitan pastries include zeppole, babà, sfogliatelle and pastiera, the latter of which is prepared for Easter celebrations. Another seasonal dessert is struffoli, a sweet-tasting honey dough decorated and eaten around Christmas. The traditional Neapolitan flip coffee pot, known as the cuccuma or cuccumella, was the basis for the invention of the espresso machine and also inspired the Moka pot. Naples is also the home of limoncello, a popular lemon liqueur. Limoncello is produced in southern Italy, especially in the region around the Gulf of Naples, the Sorrentine Peninsula and the coast of Amalfi, and islands of Procida, Ischia, and Capri. Traditionally, limoncello is made from the zest of Femminello St. Teresa lemons, also known as Sorrento or Sfusato lemons. The lemon liquid is then mixed with simple syrup. Varying the sugar-to-water ratio and the temperature affects the clarity, viscosity and flavor. Tomatoes entered Neapolitan cuisine during the 18th century. The industry of preserving tomatoes originated in 19th century Naples, resulting in the export to all parts of the world of the famous “pelati”(peeled tomatoes) and the “concentrato” (tomato paste). There are traditionally several ways of preparing tomato preserves, bottled tomato juice and chopped tomatoes. The famous “conserva” (sun-dried concentrated juice) tomato is cooked for a long time and becomes a dark red cream with a velvety texture. Buffalo mozzarella is mozzarella made from the milk of the domestic Italian water buffalo. It is a product traditionally produced in the region. The term mozzarella derives from the procedure called mozzare which means “cutting by hand”, that is, the process of the separation of the curd into small balls. It is appreciated for its versatility and elastic texture. The buffalo mozzarella sold as Mozzarella di Bufala Campana has been granted the status of Denominazione di origine controllata (DOC – “Controlled designation of origin”) since 1993. Since 1996 it is also protected under the EU’s Protected Designation of Origin and Protected Geographical Indication labels. 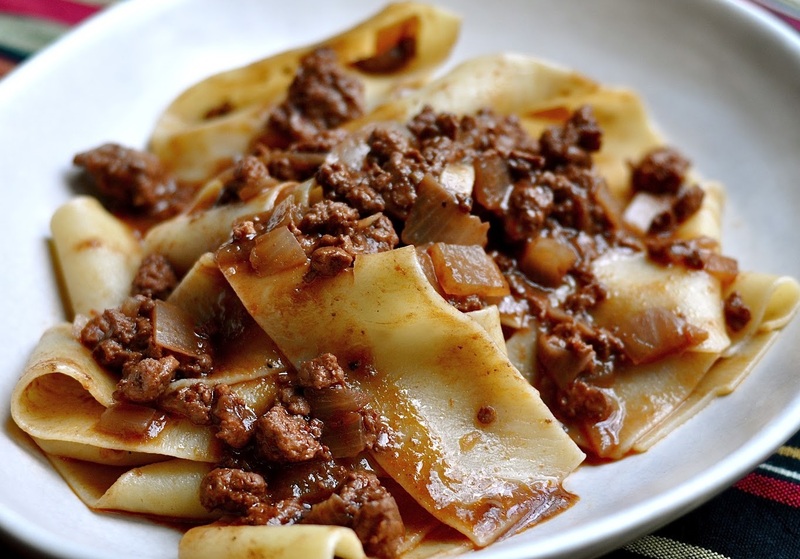 Neapolitan ragù is one of the two most famous varieties of Italian meat sauces called ragù. It is a specialty of Naples, as its name indicates. The other variety originated in Bologna. The Neapolitan type is made with onions, meat and tomato sauce. A major difference is how the meat is used, as well as the amount of tomato in the sauce. Bolognese versions use very finely chopped meat, while the Neapolitan versions use large pieces of meat, taking it from the pot when cooked and served it as a second course. Ingredients also differ. In Naples, white wine is replaced by red wine, butter is replaced with olive oil and lots of basil leaves are added. Bolognese ragù has no herbs. Milk or cream are not used in Naples. Neapolitan ragù is very similar to and may be ancestral to the Italian-American “Sunday Gravy”; the primary difference being the addition of a greater variety of meat in the American version, including meatballs, sausage and pork chops. Season the meat with salt and pepper. Tie the large pieces with cooking twine to help them keep their shape. In a large pot heat the oil and butter. Add the sliced onions and the meat at the same time. On medium heat let the meat brown and the onion soften. During this first step you must be vigilant, don’t let the onion dry, stir with a wooden spoon and start adding wine if necessary to keep them moist. Once the meat has browned, add the tomato paste and a little wine to dissolve it. Stir and combine the ingredients. Let cook slowly for 10 minutes. The sauce must cook very slowly for at least 3-4 hours. After 2 hours add few leaves of basil and continue cooking. During these 3-4 hours you must keep tending to the ragú, stirring once in a while and making sure that it doesn’t stick to the bottom. Serve with your favorite pasta. In a small bowl, sprinkle the yeast on the warm water and stir to dissolve it. Set aside until the yeast starts forming bubbles, about 5 minutes. Sift the flour. Pour the flour into a large bowl or on a work surface. Form the flour in a mound shape with a hole in the center. Pour the yeast mix in the center, then the olive oil and a pinch of salt. Using a spatula, draw the ingredients together. Then mix with your hands to form a dough. Sprinkle some flour on the work surface. Place the pizza dough on the floured surface. Knead the pizza dough briefly with your hands pushing and folding. Knead just long enough for the dough to take in a little more flour and until it no longer sticks to your hands. With your hand, spread a little olive oil inside a bowl. Transfer the dough into the bowl. Cover the bowl with a kitchen cloth, and set the bowl aside for approximately 1½ – 2 hours or until the dough doubles in volume. The time required for rising will depend on the strength of the yeast and the temperature of the room. On a lightly floured work surface, cut the dough into three equal pieces. On the work surface, using a rolling-pin and your hands, shape one piece of dough into a thin 12 inch round layer. Transfer the dough to a pizza pan. Using your fingertips, push from the center to the sides to cover the entire surface of the pan. Preheat the oven to 500 F (260 C). In a mixing bowl place the tomatoes. Stir in 1 tablespoon of olive oil, salt and pepper. Spread the tomato mixture evenly over the pizza. With your hands, break the basil leaves into small pieces. Distribute the basil uniformly over the pizza. Spread the rest of the olive oil on the pizza. Add salt to taste. Bake the pizza for approximately 10 minutes. Remove the pan from the oven and add the mozzarella cheese. Bake for 10 more minutes. Lift one side to check for readiness. Pizza is ready when the bottom surface is light brown. Top with few more fresh basil leaves, if desired, and serve immediately. Small clams and other fish are sometimes added with the calamari. Cut the squid body into slices and halve the tentacles if they are large. Clean, remove the seeds and finely chop the tomatoes. Rinse and chop the parsley. Peel and slice the garlic. Heat a generous amount of oil in a frying pan over medium-high heat. Add the garlic and cook 2 to 3 minutes. Add the peperoncino. Stir in the calamari and cook 3 to 5 minutes. Add the wine and cook until the liquid is reduced by half. Add the tomatoes and parsley and stir through. Salt to taste. Cover and cook on medium for 15 minutes. While the calamari is cooking, cook the pasta al dente. Remove some of the pasta cooking water. Stir a bit of the pasta water into the sauce and cook a few minutes longer. Drain the pasta, add it to the sauce and stir through. Palermo’s history has been anything but stable as the area passed from one dominating power to another with frequency. Its strategic position in the middle of the Mediterranean brought invaders including the Phoenicians, the Carthaginians, the Greeks, the Romans, the Saracen Arabs, the Normans, the Swabians, the French and the Spanish Bourbons, just to name a few. The result of this history is evident in the vast range of architectural styles, the names of places in the region that are obviously not Italian and the fusion of ingredients used in many local dishes. Human settlement in the Palermo area goes back to prehistoric times. It is one of the most ancient sites in Sicily. Interesting graffiti and prehistoric paintings were discovered in the Addaura grottoes in 1953 by archaeologist Jole Bovio Marconi. They portray dancing figures performing a rite with shamans. In 734 BC Phoenicians from Tyre (Lebanon) established a flourishing merchant colony in the Palermo area. The relationship of the new colony with the Siculi, the people living in the Eastern part of the Island, involved both commerce and war. 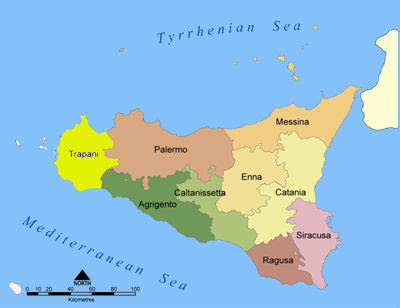 Between the 8th and the 7th centuries BC, the Greeks colonized Sicily. They called the area Panormus (“All port”) and traded with the Carthaginians, Phoenician descendants who were from what is now Tunisia. The two civilizations lived together in Sicily until the Roman conquest. Situated on one of the most beautiful promontories of the Mediterranean, Palermo is an important trading and business center and the seat of a university. Palermo is connected to the mainland by an international airport and an increasing number of maritime links. The city of Palermo is vibrant and modern and its large harbor and international airport makes it a popular tourist destination. There are many events and festivals that take place throughout the year in Palermo, the most important of which is the feast day of the city’s patron saint, Saint Rosalia. There is a sanctuary dedicated to her at the top of Monte Pellegrino, just outside the city, and the mountain dominates the backdrop to the city. The surrounding area is a green and pleasant nature park and is a favorite picnic area for locals. Also in Palermo are the Catacombs of the Capuchins, a tourist attraction. In the Sicilian food culture there is no such thing as a “main course”, but rather a series of courses of varying number, depending on the occasion, usually a (primo) first course of pasta, soup, rice, etc. and a (secondo) second course of meat, fish or vegetable, often served with a (contorno) side dish of vegetables. Fresh fruit is usually served as dessert. For a more formal occasion an (antipasto) appetizer comes before the primo. A number of popular foods are typically served as side dishes or “starters.” Arancini are rice balls stuffed with meat or cheese encrusted in a crispy coating. Caponata is a mixture made with eggplant, olives, capers and celery, and served as an appetizer. Sfincione is a thick form of pizza made with tomatoes, onions and anchovies, usually made in bakeries rather than pizzerias. Panella is a thin paste made of crushed or powdered ceci (garbanzo) beans and served fried. Maccu is a creamy soup made from the same bean, usually served in winter. Crocché (croquet) are fried potato dumplings made with cheese, parsley and eggs. Fritedda is a springtime vegetable dish or pasta sauce made with fresh green fava beans, peas and artichoke hearts. Ricotta is a soft cheese made from sheep’s milk and Ricotta Salata is an aged, salty version. Caciocavallo is aged cow’s cheese used for cooking. Canestrato is similar but made from sheep’s or goat’s milk. Tuma and Primo Sale are sweeter and softer, aged only briefly. Gattò is similar to quiche and made with potatoes, ham and cheese. Sicily is renowned for its seafood. Grilled swordfish (pesce spada) is popular. Smaller fish, especially triglie (red snapper), are sometimes prepared in a vinegar and sugar sauce. Seppia (cuttlefish) is served in its own black sauce with pasta. Another Sicilian seafood dish made with pasta is finocchio con sarde (fennel with herring). Ricci (urchins) are popular in spring. Beccafico are stuffed roasted sardines. Meat dishes are traditionally made with lamb or goat. Chicken is usually served on skewers and spiedini are small meat rolls (involtini), also, on a skewer similar to shish kebab. Salsiccia alla pizzaiola is a port sausage filled with onions, tomatoes and other vegetables. Couscous is usually served with meat or seafood. Sicilian desserts are outstanding and popular. Cannoli are tubular crusts filled with creamy sheep’s milk ricotta. Cassata is a rich cake filled with the same ricotta filling. 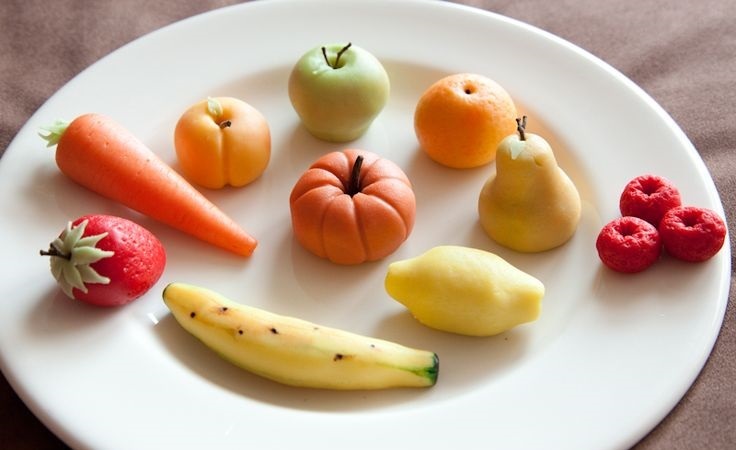 Frutta di Martorana are almond marzipan pastries colored and shaped to resemble real fruit. Sicilian gelato (ice cream) is popular with flavors ranging from pistachio and hazelnut (nocciola) to jasmine (gelsomino) to mulberry (gelsi) to strawberry (fragala) and rum (zuppa inglese). Not many people outside of Sicily are familiar with Torta Setteveli. The cake of the seven veils, named after the dance of Salome. The Torta Setteveli is the typical birthday cake in Palermo. It’s a combination of alternating chocolate and hazelnut layers, with a crunchy layer that combines both those flavors. There are many stories about who actually created the cake. You can find the cake throughout Sicily, but it is in every pasticceria in Palermo. The Palermitani see it as the ultimate dessert to enjoy on special occasions, especially for birthdays. This dish is a popular “pasta bake” in Palermo and it is made with a very specific pasta shape called anelletti (little rings). In Sicily it is often sold in cafés as timbaletti, which are single portions that are shaped like a cone. When eaten at home, however, it is often made like a “pasta cake” to be portioned and shared by the whole family. Wash the eggplant, peel and slice them lengthwise about 1/4″ thick. Coat each slice with olive oil, put them on a baking sheet and bake for 10 minutes at 350 degrees F. Set them aside. Turn the oven to 375 degrees F.
In a saucepan, add a 1 tablespoon of olive oil and brown the ground pork and beef. Discard any fat that is produced. Set aside in a separate bowl. In the saucepan, add 2 tablespoons of olive oil and the onion. Once the onion is translucent add the browned ground meat. Saute the meat and onion for a few minutes and add the peas followed by the crushed tomatoes and the basil. Add salt to taste. Cover and let the ragu cook for 20 minutes over medium heat. In a large pot of boiling salted water, cook the pasta al dente and drain well. Place in a mixing bowl. Add a few tablespoons of the sauce to the pasta so that it does not stick together and set aside. In a 10″ x 5″ bundt, tube or springform pan line the bottom and sides with the slices of baked eggplant so that part of the slices hang outside the top of the pan. Add a layer of pasta followed by a layer of the meat sauce, some grated cheese, a layer of mortadella and then a layer of mozzarella. Repeat the layering process again. Once finished, turn the eggplant slices hanging from the pan onto the top of the pasta. Bake in a preheated oven at 375 degrees F for 30 minutes. Let rest before cutting. Garnish with grated cheese and parsley or basil. Heat a skillet and add the olive oil and crushed garlic. When the garlic is browned, add the tomato, salt and pepper. Add the wine and bring the sauce to boil, add the cod fillets and cook for 6-7 minutes, turning them over once. Add some more salt and pepper (if needed), the olives and capers. Serve with a sprinkle of chopped parsley on top. Clean the fennel bulbs and cut them in half. Boil them until al dente (fork tender) in lightly salted water. Drain them well and quarter the halves. Mix the breadcrumbs together with the cheese. Lightly beat the eggs with salt and pepper. Dredge the fennel slices in the flour to coat well, then dip the slices in the egg and then the breadcrumbs. Fry them in abundant hot oil until golden brown. Drain on paper towels. This is a classic Sicilian cake. The word Cassata derives from the Latin Caseus, which means cheese. Cassata is one of the world’s first cheesecakes. 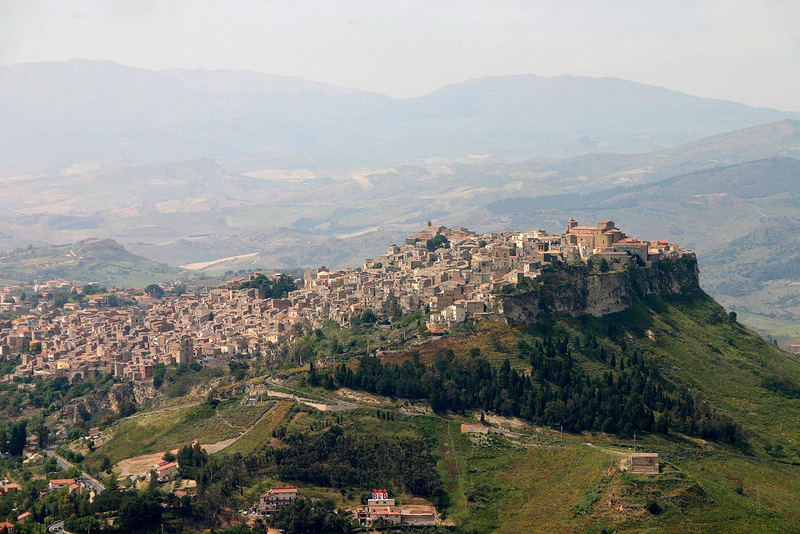 It comes as no surprise that there are a great many variations throughout Sicily. Whip 6 egg whites to firm peaks with a pinch of salt. In another bowl, beat the 6 yolks with 3/4 cup of the granulated sugar until the mixture is frothy and pale yellow. Turn the batter into a buttered and floured pan (9 inch square) and bake it for a half hour; remove the cake from the oven and let it cool before removing it from the pan. Grind the almonds in a food processor, using short bursts until finely ground. Add 2 1/2 cups of powdered sugar and the almond water; blend until the mixture is homogenous. Dust a work surface with the potato starch before turning the paste out onto it (you can also turn it out onto a sheet of wax paper) and incorporate a few drops of green food coloring diluted in a few drops of water. Work the paste until the color is uniform and then wrap the paste in plastic wrap and chill it in the refrigerator. Press the ricotta through a fairly fine wire mesh strainer and combine it with 1/2 cup of granulated sugar, the vanilla, the shaved chocolate and the diced candied fruit. Roll the almond paste out to 1/4 inch (1/2 cm) thick and wide enough to cover the cake pan bottom and sides. Fit the almond paste into the pan. Next, line the bottom and sides of the pan with half-inch thick pieces of the baked cake. Make a syrup by diluting some Marsala with a little water and a little sugar, and sprinkle it over the cake. Fill the empty space with the ricotta mixture and cover it with more of the cake, sprinkling again with the Marsala syrup. Lay a dish on the cassata, press down gently, and chill the cassata for several hours in the refrigerator. Turn the cassata over onto the serving dish and remove the pan and the plastic wrap. Beat the remaining two egg whites and sift the remaining powdered sugar into them, beating continuously until thick. Add 2 tablespoons of lemon juice and spread it over the cassata. Let the glaze set for a few minutes, then decorate the cassata with candied fruit. Chill the cake for several more hours before serving. The Province of Rieti is located in the northeast section of the Lazio region in the heart of Italy and was established in 1927. The territory is mostly mountainous and there are two artificial lakes created during the Fascist period. There are several protected areas in the province. To the south lies the Parco regionale naturale dei Monti Lucretili and to the southeast is the Riserva regionale Montagne della Duchessa. Between the two areas is the Riserva naturale Monte Navegna e Monte Cervia. These areas support a diversity of wildlife, particularly birds such as herons and grebes. Numerous castles, fortresses and Franciscan sanctuaries can be found throughout the Rieti Province. During the Roman Empire the province was a strategic point in the early Italian road network, that was known as the “salt” track and it linked Rome to the Adriatic Sea through the Apennine Mountains. According to Roman tradition, a stone bridge was laid across the Velino river and a large viaduct was built to bring goods from the road directly to the cities. After the fall of the Roman Empire the province suffered destruction by invaders. The area was rebuilt during the 12th century and for a time it was a favorite Papal seat. Feasts and festivals are also among the province’s highlights. A festival dedicated to St. Anthony of Padua has taken place for 600 years in the old town of Rieti, with a procession through the streets. In Antrodoco, the Sagra degli Stracci (Festival of Rags) is an occasion to taste local culinary specialties. The Festa della Madonna della Neve e del Toro Ossequioso (Festival of Our Lady of the Snow and of the Fulsome Bull) is held in Posta, in which a man rides a harnessed bull and brings it before the Church of Santa Maria Assunta, where it will be made to kneel three times. The Festa Dolce Primavera (Sweet Spring Festival) in Castel Sant’Angelo is a competition between the 10 municipalities in preparing the most delicious desserts. There are many any are carnival festivities, with floats parading through the towns of Amatrice and Magliano Sabina during the celebrations. The presence of forests means that local produce includes chestnuts, mushrooms, blackberries, blueberries, strawberries, juniper and white and black truffles. The farms produce fresh, salted or seasoned cheese, such as ricotta made with goat’s milk; the Fiore Molle from Leonessa, flavored with saffron and pecorino from Amatrice. Growing conditions for vegetables is ideal, especially for garlic, tomatoes, potatoes, artichokes, olives and grapes. Sausages come from Leonessa and Amatrice and dry sausages are made in the city of Rieti. Fried pizzas in the Rieti area are usually eaten with cold meats like ham, sausage or pork loin and they are sometimes stuffed with vegetables and cheese. Amatriciana is one of the best known pasta sauces in Roman and Italian cuisine. Local favorite dishes include stracciatelle in brodo (similar to egg-drop soup); spaghetti all’amatriciana; pollo (chicken) alla diavola; stracci di Antrodoco – thin pancakes filled with meat sauce and cheese; stufatino garofolo and spezzatino di pollo (chicken stews), agnello in guazzetto (lamb stew) and porchetta di Poggio Bustone (pork). Sweets include: terzetti alla reatina, soft cookies made with honey and nuts; copeta are made with honey and nuts between layers of bay leaves and pizza di Pasqua (Easter pizza). A well-known local wine is Colli della Sabina D.O.C. and it is available in white, red and rosé. In a hot grill pan, toast the bread on each side; then lightly rub one side with a clove of garlic and drizzle each with olive oil. Set aside. Slice the mushrooms thickly taking care to keep the stalk and the cap intact. Smash the garlic cloves with the flat blade of a knife. In a heavy skillet, heat the olive oil and butter and fry the smashed garlic for a few seconds before adding the mushrooms. Add the mushrooms and cook over high heat until they are browned and just cooked. Remove the garlic. Season with salt and pepper. Place the bruschetta on warm plates and top with the mushrooms and parsley leaves. Serve immediately. Cut each eggplant in half lengthwise. Using a sharp paring knife, cut a box in the center of each eggplant half, coming about half an inch from the sides and cutting down to within half an inch of the bottom. Using a large spoon, pry the center free. It should come out fairly easily and use the spoon to scrape any excess eggplant from the inside of the box. Place the eggplant shells cut side down on a baking sheet lined with paper towels. Cover the excess eggplant flesh with plastic wrap and set aside. Repeat, cleaning all the eggplants. Chop the onion and combine it with one-fourth cup of the olive oil in a large skillet. Place the skillet over medium-high heat and cook until the onion softens, about 5 minutes. Add the minced garlic and reduce the heat to medium-low. Add the meat to the skillet and season with salt and pepper. Cook, stirring occasionally, until the meat is lightly brown, about 5 minutes. Finely dice the reserved eggplant flesh and add it to the skillet and cook until the eggplant has softened completely, about 5 to 7 minutes. Season with salt and pepper. Add 1 cup of the crushed tomatoes and cook for 5 minutes. Stir in the pine nuts and parsley and remove from the heat. Oil a large baking dish with the remaining olive oil and pour the remaining crushed tomatoes into the dish. Arrange the eggplant halves in the baking dish. They should fit tightly. Spoon the meat mixture into the eggplant halves, dividing evenly. Cover the baking dish with aluminum foil and bake 15 minutes, then remove the foil and spoon some of the tomatoes from the bottom of the baking dish over the eggplant. Re-cover with aluminum foil and bake, spooning the tomato mixture over the eggplants once after another 15-minutes. After 45 minutes total cooking time, scatter the grated cheese generously over the top of each eggplant. Bake uncovered until the cheese is lightly browned, 5 to 10 minutes. Remove from the oven and cool at least 10 minutes before serving. When the water comes to a rolling boil, add salt and, then, add the celery. Blanch until it is still slightly crunchy, about 2 minutes. Remove the celery using a slotted spoon and scatter it on a baking sheet to cool. Add the potatoes to the boiling water and cook until tender, about 20 to 25 minutes. Drain them and place on a rimmed baking sheet to cool. When the potatoes are cool enough to handle but still warm, peel them using a paring knife. Carefully cut the potatoes into 1/4-inch thick slices. In a large bowl, season the warm potatoes with salt and pepper. Pour the olive oil over the potatoes and mix well. Add the parsley and celery and mix well. Let it sit for an hour. Garnish with the olives and serve at room temperature. In a bowl, combine flour, baking powder, salt and baking soda. Set aside. Grease two baking sheets. Form chilled dough into logs and place on the prepared baking sheets. Bake 10 minutes or until golden brown. Be sure not to overcook or they will be dry. While warm, dip in a bowl of melted butter and then into a bowl of sesame seeds. Cool on a wire rack. 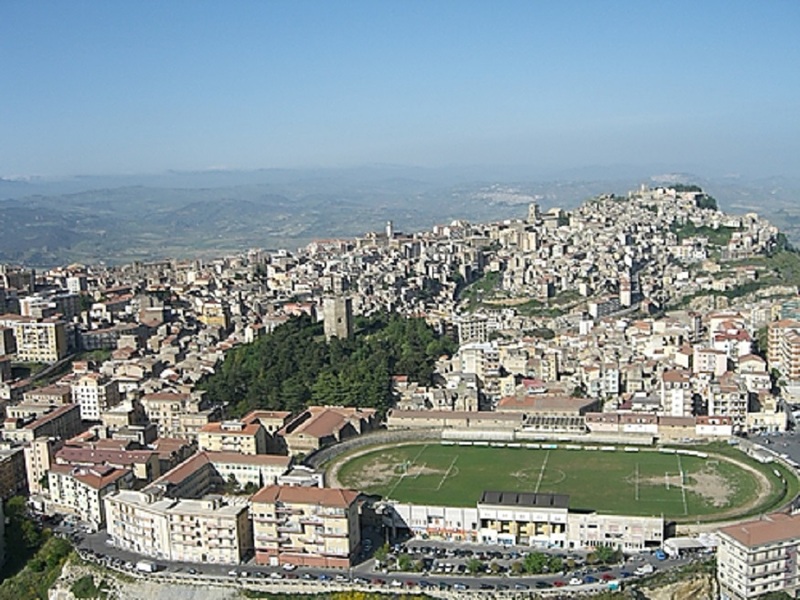 Enna is a province in Sicily, Italy. It is located in the center of the island and is the only province in Sicily without a seacoast,yet it possesses the greatest number of ponds and lakes.. The capital city sits on a high elevation giving a gorgeous view of the region.There are many castles, cathedrals, churches and interesting archeological areas, 8 lakes, many nature reserves and forests within the province. Villa Romana del Casale, a huge ancient Roman “villa”, where there are many well-preserved Roman mosaics. Morgantina, an ancient town in the province, whose important archeological discoveries are housed in many large museums around the world. Torre Pisana, a very large tower that provides an extensive panoramic view of the surrounding countryside. 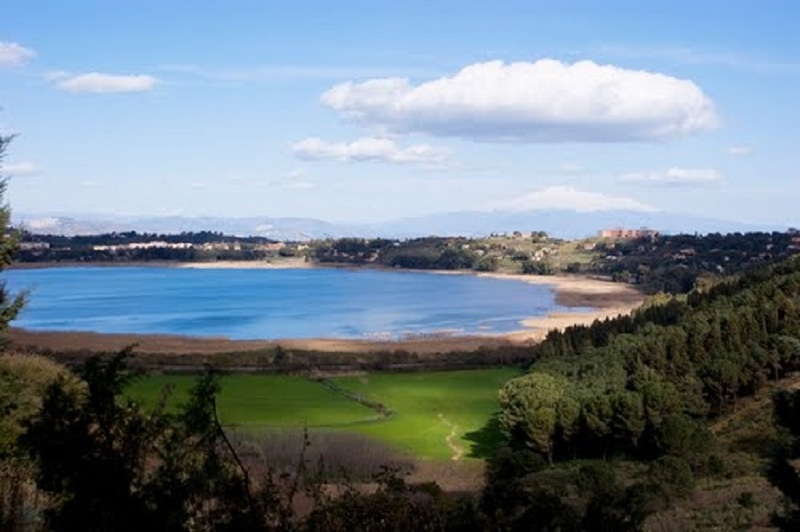 Lake Pergusa has a forest inside a wildlife reserve, where thousands of rare birds can be found. The Autodromo di Pergusa is the most important racing circuit of Southern Italy. 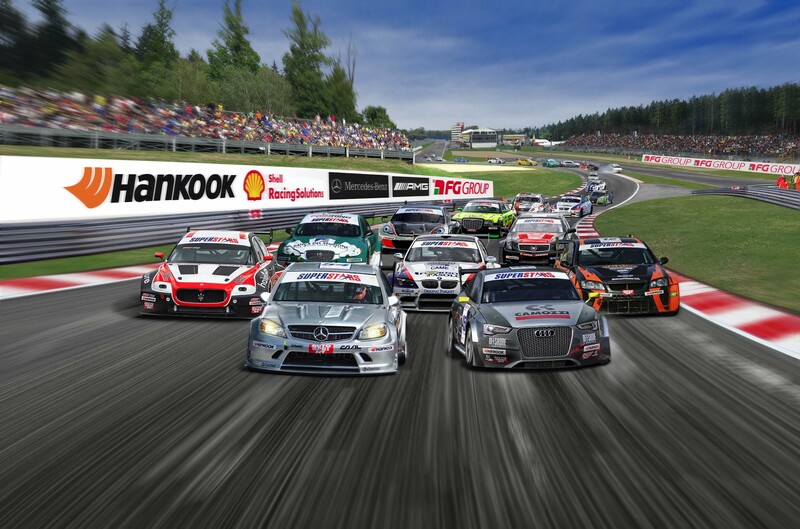 It hosts international competitions, such as Formula One, Formula 3000, and the Ferrari Party with Michael. Built in 2009, Regalbuto is a popular theme park in the area. Enna’s cuisine is characterized by simple dishes that reflect an agricultural and sheep farming community. Vegetables, oranges, lemons, eggs and cheese are used in many local recipes. Pastas with mashed beans, cauliflower, broccoli, eggplants or tomatoes are common. Wild asparagus are a great local favorite and so are bitter chicory and wild fennel. 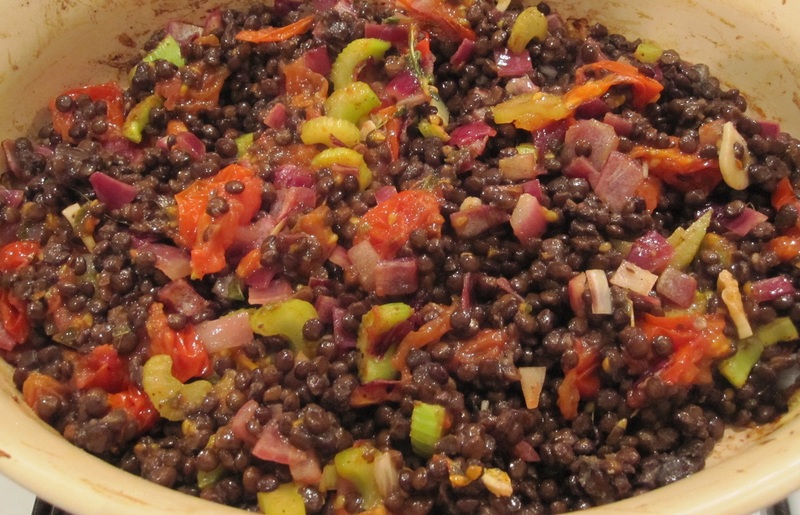 Black Lentils from Leonforte, near Enna are well-known and used quite often in Sicilian cooking. Baked or grilled pork, lamb or goat meat and strong cheeses complete the typical menu. Cookies stuffed with dried figs, honey, fruit candy and roasted almonds along with a glass of limoncello, fare typical holiday celebrations. Quite famous is Piacentinu, a cooked, semi-hard cheese. It is round in shape and available in various ages. Traditionally, it is made in the province of Enna, Sicily, using whole sheep’s milk, pepper and saffron. Since the 1100s, piacentino has been known for its saffron color. Ruggero the Norman (1095-1154), the king of Sicily, asked local cheese-makers to make this cheese with saffron because he believed that spice caused an uplifting, anti-depressing effect. Pepper, a rare and precious spice at the time, was also added to the cheese because it was a popular ingredient in the Sicilian Court. Today, this cheese is still made using whole, raw milk from sheep that graze primarily on veccia, a leguminous weed found in and around Enna. 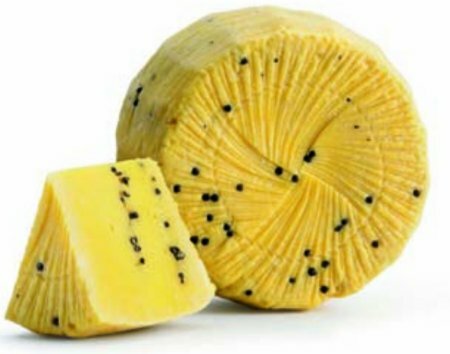 The plant gives the cheese its distinct flavor. The milk, together with sheep or goat rennet, is heated to 140 degrees F and then whole black peppercorns and saffron are added. Once a mass has formed, the cheese is left to cool in its whey. The cheese is ready after a week. A wheel of piacentino is usually 14 to 16 inches in diameter and weighs between 13 to 26 lbs. The cheese has a soft rind, a yellow color and a delicate, savory flavor. This lentil dish is often served with fish. Place lentils in a saucepan with 2 cups of cold water, cover, bring to a boil over medium-high heat, then lower the heat to simmer. Cook gently for 15 minutes. Mix in the vegetables, cover the pan and continue cooking gently until lentils are tender, about 35-40 minutes. Season with sea salt and pepper to taste. Place cleaned artichokes in bowl with lemon halves and water. While the artichokes are soaking, prepare the stuffing by heating the butter with 3 tablespoons of oil in 8-inch skillet. Add minced garlic and saute 30 seconds. Add bread crumbs and dried Italian seasoning. Stir for 1 minute while the bread crumbs brown slightly. Remove from the heat and stir in the grated cheese. Spread the leaves of the artichokes open by hitting the chokes upside down on a work surface to spread the leaves open. Fill each with about 1/2 cup of the crumb mixture. Place each artichoke in a deep pot with water 1/4 of the way up the side of the pot. Add 1 teaspoon salt to water and drizzle with the remaining 1 tablespoon oil over artichokes and place lemon slices on top. Cover: bring to a boil, reduce heat to a simmer and cook on low for 45 minutes or until tender. 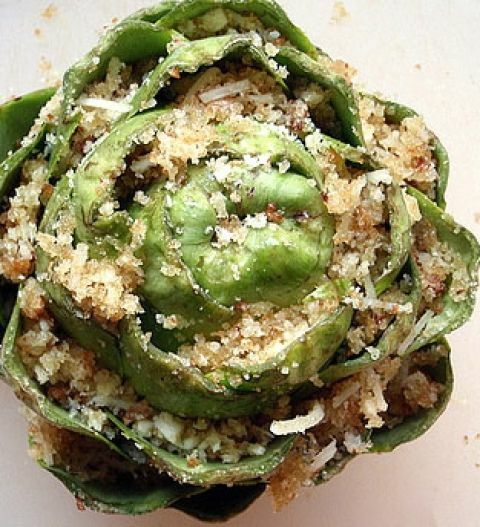 (the size of the artichoke will vary the cooking time). Remove from the heat and serve room temperature. In a 4 quart saucepan saute the onion in olive oil until wilted. Add the pork and break up over medium heat until its raw color disappears. Add the wine and simmer for a few minutes over slightly higher heat. Add tomato paste and water; stir and bring to a simmer. Add salt, pepper, cinnamon, chocolate and sugar. Stir until chocolate melts, reduce heat and simmer for around 30 minutes. Serve over pasta with grated cheese. Salmoriglio is a Sicilian marinade and sauce that is easy to make and add a great deal of flavor to poultry and fish. Use the recipe below to marinate chicken for up to two days in the refrigerator, shrimp for up to 30 minutes or to pour over grilled fish. Combine lemon juice, garlic and seasonings and whisk to combine. Slowly whisk in olive oil for a creamy semi-emulsified sauce for already cooked fish. For a marinade, combine all the ingredients in a gallon sized plastic zippered bag and shake with chicken or shrimp to combine. Double the recipe to marinate a whole chicken. For a change of flavor, use three tablespoon chopped fresh flat-leaf parsley instead of or in addition to the oregano. Try to get swordfish with the skin on if grilling outdoors; this will help keep the fish from drying out. Rub or brush olive oil on the fish. Oil the grill (use a grill pan or fish basket) or non-stick pan. Over medium heat, cook the steaks for 3 to 4 minutes per side, depending on the thickness of the pieces. Salt and pepper after each side is cooked, not before. When the fish is done, it will be opaque and a knife will slide into it easily. If the fish had skin, remove it after cooking. 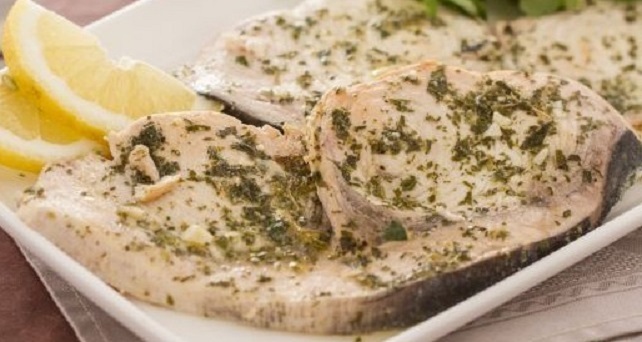 Drizzle Salmoriglio over the fish; garnish with lemon wedges and flat-leaf parsley if desired. 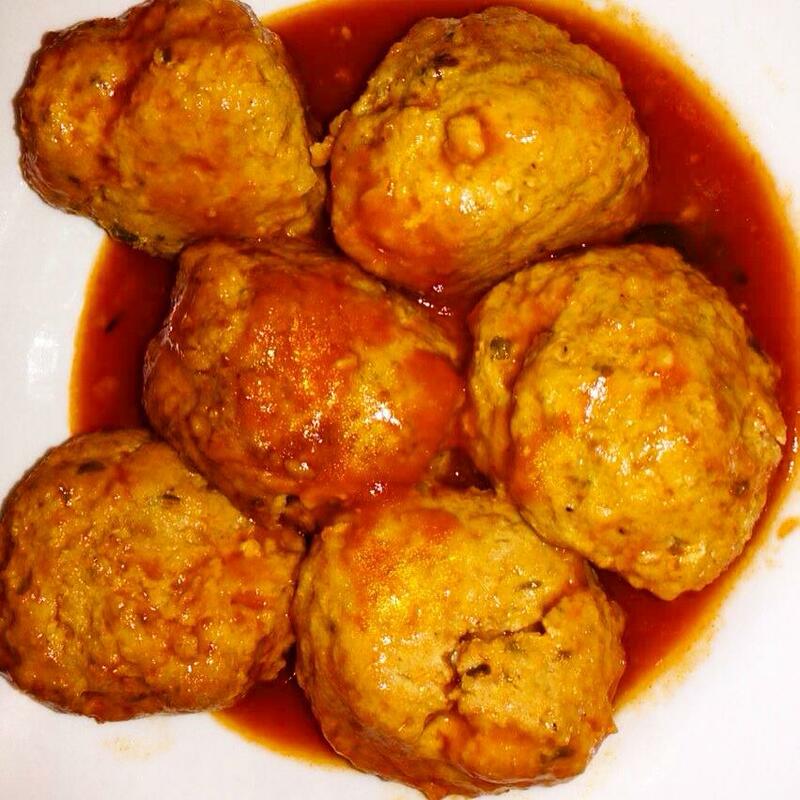 This authentic Italian recipe is at least 5 centuries old and originates in Enna, Sicily. 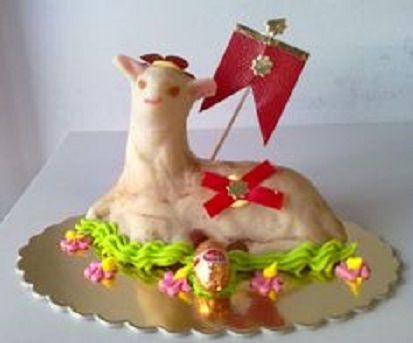 During the Easter season every year, shops sell marzipan figures and fruit decorated in festive colors. They are garnished with colored sweets, foil covered chocolates and red and gold processional flags. The origins of these elaborate sweets are in the Sicilian convents. Impoverished families enrolled daughters, whom they could not afford to feed or marry, into convents where they knew their daughters would be fed and safe. The nuns produced traditional Easter and Christmas cakes along with brightly decorated fruits. Small wheels were built into the entrance gates to the convents and money was exchanged for the ornately decorated little cakes. The money earned from the bakery supported the nuns and the upkeep of the convents. Dry the blanched almonds well in a hot oven if you blanch them yourself. Grind using a mortar and pestle; if you use a food processor, pulse rather than blend so that the almonds are ground but not so fine that they give off their oils. Dissolve the sugar in a little hot water. Add the ground almonds and simmer over very low heat, stirring constantly until a paste-like mixture comes away easily from the sides of the pan. If you want to color the marzipan, divide it into bowls and color as desired. Paste colors are recommended rather than liquids for strong, true colors. Allow the marzipan to cool enough to handle easily. Either roll or pat the marzipan onto a cornstarch-dusted surface and cut into shapes or pat into molds that have been dusted with cornstarch. Allow to dry at room temperature until firm. Source: 2009 All Things Sicilian. As immigrants from the different regions of Italy settled throughout the various regions of the United States, many brought with them a distinct regional Italian culinary tradition. Many of these foods and recipes developed into new favorites for the townspeople and later for Americans nationwide. 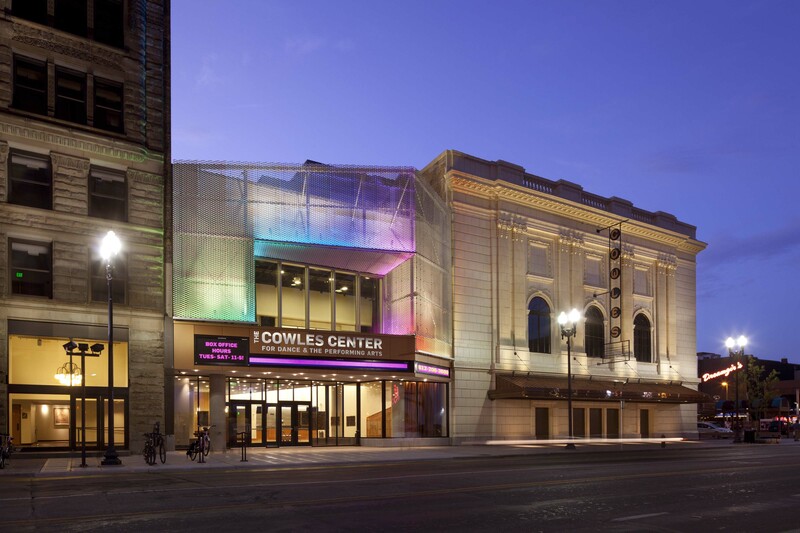 The ICC (The Italian Cultural Center) was established as a center in Minneapolis for all things Italian and to serve as a beacon for classic and contemporary Italian culture through language, art, music, design, cinema, architecture and technology. The ICC draws Italian-Americans who want to learn more about the culture and connect with their roots. Discovering modern Italy is a goal for ICC’s students. Some of the students who come to study language here also enjoy learning about what Italy is like now. The Center’s seven university-trained teachers are from Italy and bring their own diverse heritages into the classroom, giving students a glimpse of life in some of the small towns and villages. Films are a big part of the Italian cultural experience. Since the development of the Italian film industry in the early 1900s, Italian filmmakers and performers have enjoyed great international acclaim and have influenced film movements throughout the world. As of 2015, Italian films have won 14 Academy Awards for Best Foreign Language Film, the most of any country. Every year, the ICC presents a series of outstanding contemporary films in their annual Italian Film Festival. 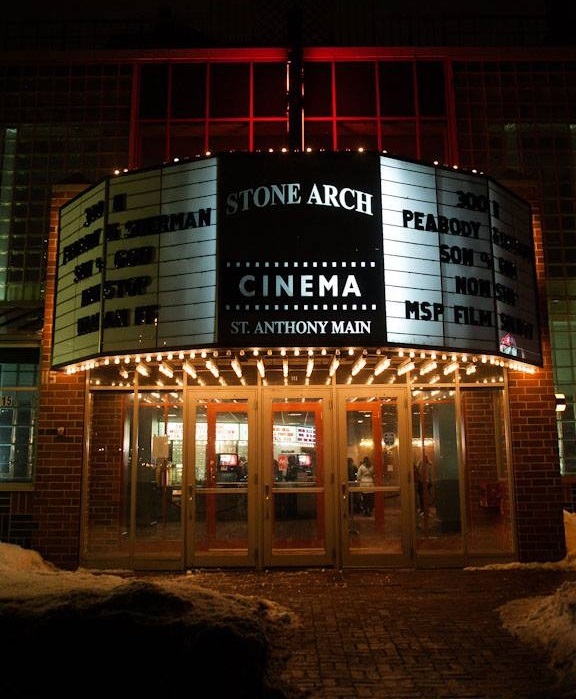 They also offer screenings throughout the year in the CineForum series. Through the lens of drama, comedies, documentaries and movies, the view of Italy is broadened and offers a fresh perspective on the country and its people. It is a way to take a journey to Italy without leaving Minnesota. The desire to show Twin Cities’ residents the real Italy has led them to select films by modern Italian directors for the ICC’s annual free film festival, held in collaboration with the Italian Film Festival USA and the Minneapolis College of Art and Design (MCAD). The Italian film series offers a glimpse into award-winning, post-war Italian films and the high fashion industry they launched. Inspired by her travels and studies in Tuscany, Carmela Tursi Hobbins created Carmela’s Cucina to teach the art of Italian cooking and entertaining. Her experience blends years as co-owner of a successful catering business and her background as a classroom teacher. She has written two cookbooks, Carmela’s Cucina and Celebrations with Carmela’s Cucina. Boil the tortellini for about 6 minutes in salted water. Drain and put the tortellini into a bowl of ice water to stop the cooking. Wash the tomatoes and basil and pat dry. 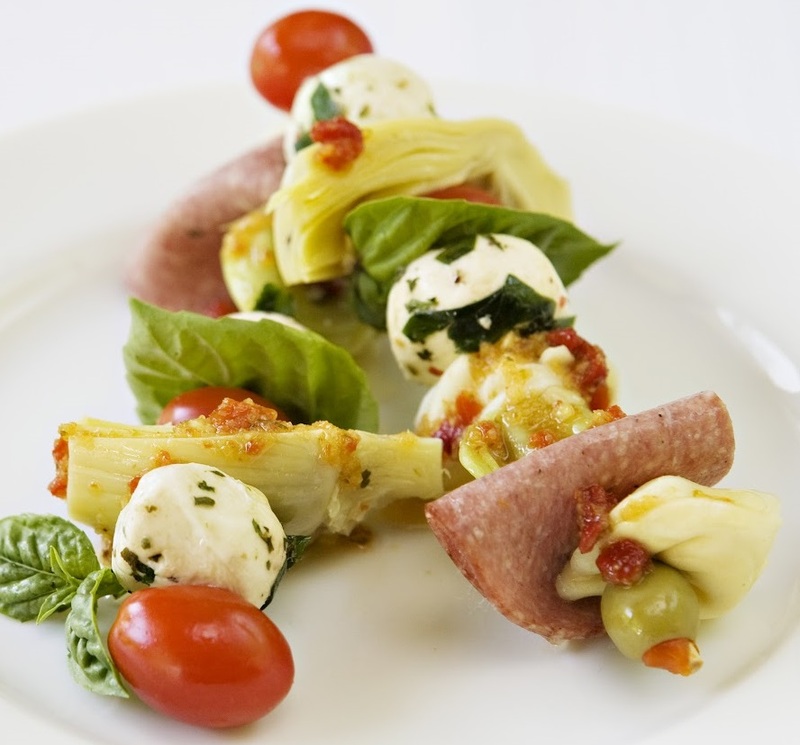 Thread the tortellini, tomatoes, basil leaves, artichoke hearts, mozzarella, olives and salami (folded into quarters) onto the skewers. Using one package of the Italian salad dressing mix, make up the dressing following the directions on the package and drizzle the dressing over the prepared skewers. Sprinkle the contents of the second envelope of dried Italian Salad mix over the skewers and let marinate for several hours. When ready to serve, assembled skewers can be stuck into a melon or pineapple half or laid on a lettuce lined tray. Little Italy is a neighborhood in Omaha, Nebraska that, historically, has been the home to the city’s Italian population. Omaha’s first Italian community developed during the 1890s near the intersection of South 24th Street and Poppleton Street. It was formed by immigrants from southern Italy and Italian immigrants who moved there after living in the eastern states. In 1905, Sicilian immigrants settled along South 6th Street in the hills south of downtown. Additional immigrants from Sicily arrived between 1912 and 1913 and following World War I. Two brothers, Joseph and Sebastiano Salerno, are credited with creating Omaha’s Little Italy, located near the Union Pacific yards in downtown. When Sebastiano took a job as an agent for a steamship company in 1904, he encouraged friends from Sicily to emigrate. Joseph then secured housing and jobs for the immigrants, particularly in the downtown Omaha’s Union Pacific shops that included grocery stores, clothing and shoe stores and the Bank of Sicily, established by the Salerno brothers in 1908. Today, the Festival of Santa Lucia is still celebrated throughout Little Italy, as it has been since the arrival of the first immigrants. An annual festival called “La Festa” is held to unite the city’s Italian community and celebrate its heritage. Many other remnants of Little Italy endure, making this area distinct within the city. Little Italy has several landmarks, including St. Francis Cabrini Church, built in 1908 at 1335 South 10th Street. Other landmarks include the Santa Lucia Festival Committee Hall at 725 Pierce Street; Marino’s Italian Grocery at 1716 South 13th Street; Sons Of Italy Hall located at 1238 South 10th Street and Orsi’s Bakery at 621 Pacific Street. Orsi’s Bakery and Pizzeria is a gold mine for Italian fare. 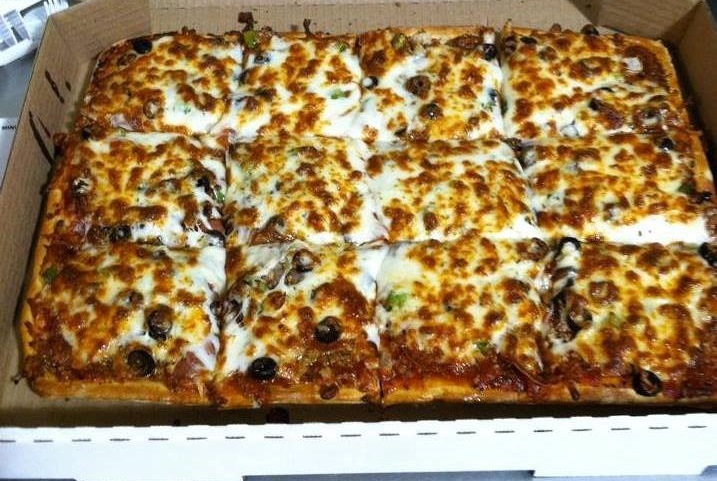 Their Sicilian style pizza, in particular, has been popular since they first opened in 1919. 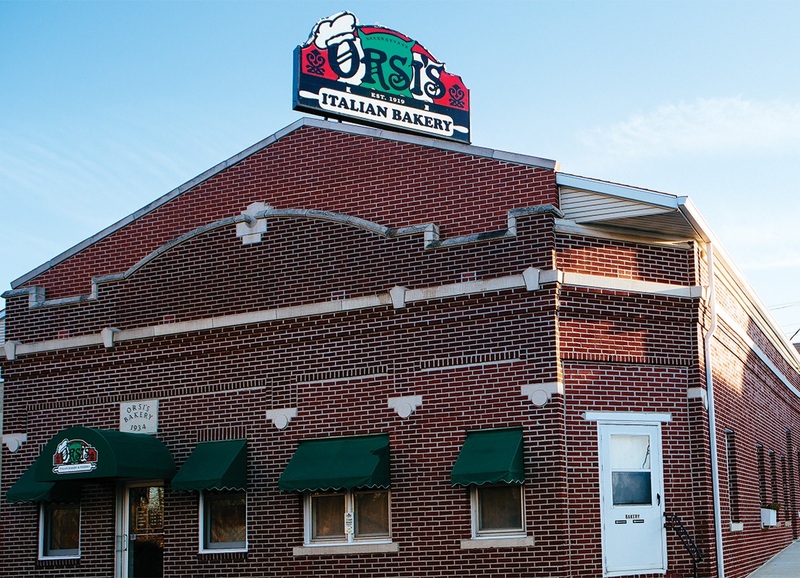 Passed through the Orsi family for over 90 years, the interior and the owners may have changed, but the recipes have stayed the same. Along with pizza, their Italian deli offers a variety of meats, cheeses, olives, peppers and desserts. Chefs at Omaha’s Piccolo Pete’s flavor the sauce for their spaghetti with beef steak trimmings and pork and beef bones. In the true sense of Italian American cuisine this recipe combines Italian heritage cooking with Omaha’s love of beef. Heat the oil in an 8-qt. saucepan over medium-high heat. Working in batches, cook bones and steak trimmings until browned, 7–9 minutes. Transfer to a plate. Add garlic and onion; cook until golden, 6–8 minutes. Add tomato paste; cook until slightly caramelized, about 3 minutes. Add sugar, celery seeds, basil, tomatoes, bay leaves, salt and pepper. Bring to a boil. Reduce heat to medium-low; add bones and trimmings. Cook, until the sauce is reduced by a third, about 1 hour. Discard bones, trimmings, basil and bay leaves; shred the meat and add it to the sauce. Bring a large saucepan of salted water to a boil. Cook spaghetti until al dente, about 10 minutes. Drain and divide among serving bowls; ladle with sauce. Sprinkle with Parmesan. The Columbus Park area is Kansas City’s Italian neighborhood. Although ethnic lines are less distinctly drawn than in years past, the unique character of the neighborhood remains. 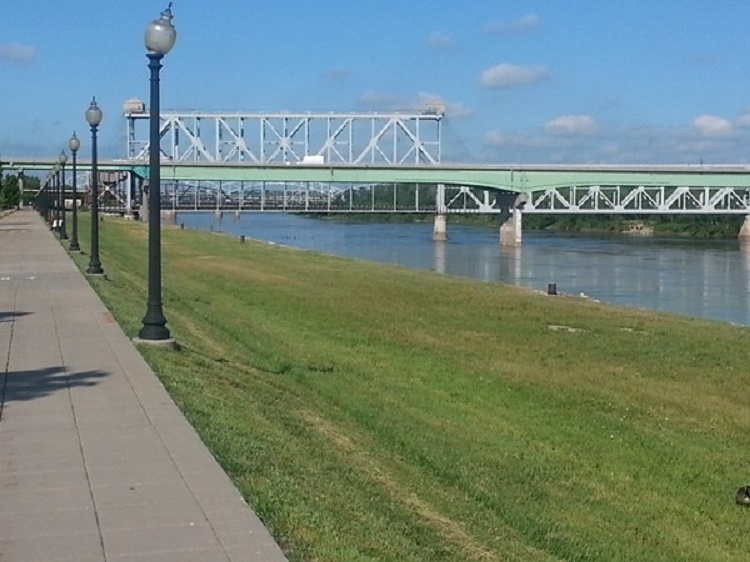 Unlike other Little Italys that blur into other neighborhoods, Columbus Park has established boundaries: the Missouri River on one side and the Heart of America Bridge on the other. As one of Kansas City’s oldest immigrant neighborhoods, it has also had a long history of social infrastructure and culture. By 1920 there were about 10,000 Italians living in the area. The heart of the community is the Holy Rosary Catholic Church. Built in 1895, the Church was the result of petitioning by the local Italian community for a church. Bells still toll on Sunday mornings and services have continued in the building for more than 100 years. The main business area is found along 5th street, where there are many Italian restaurants and grocery shops. You will find traditional foods and products at Garazzo’s Ristorante, LaSala’s Deli and LaRocca’s Grocery. Wish-Bone Salad Dressing originated in Kansas City. 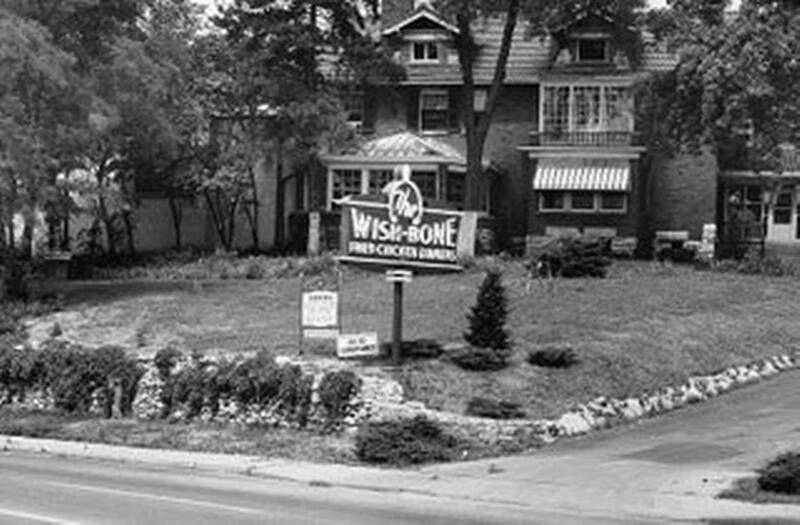 In 1945, returning World War II veteran, Phillip Sollomi, opened a family-style chicken restaurant in Kansas City called, The Wish-Bone®. In 1948, Sollomi began serving his mother’s salad dressing made from a recipe she brought with her from her native Sicily. As demand grew, Sollomi began mixing the dressing in a 50-gallon drum and bottling it. The dressing became known as“The Kansas City Wish-Bone® Famous Italian-Style Dressing. 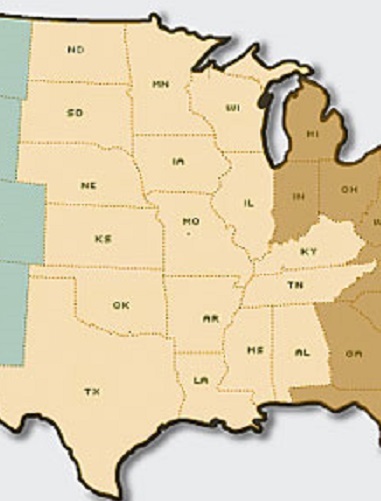 Word of this unique salad dressing spread throughout the heartland. In 1957, Sollomi sold the business to Lipton. Chef Jasper Mirabile grew up in an Italian family. Each year he travels back to Italy and his family’s hometown of Gibellina, Sicily to see family and friends. He also goes to do research on the authenticity of Sicilian cuisine and to learn as much as he can about its rich history. Place pork & beef in a large bowl. Add the eggs, cheese, parsley, minced garlic, onions and salt and pepper to taste. Mix. Add the bread crumbs and blend into the meat mixture. Slowly add the water until the mixture is moist. Shape the meat mixture into 2 1/2- to 3-inch balls. Heat the oil in a large skillet. Add the meatballs and fry in batches, being careful not to crowd the pan. When the bottom half of the meatballs are well browned and slightly crisp, (usually takes about 5 to 6 minutes), turn them over and cook the other side for 5 minutes more. Remove the meatballs from the heat and drain them on paper towels. Simmer in your favorite sauce. Chef Jasper J. Mirabile Jr. runs his family’s 59-year-old restaurant, Jasper’s, with his brother. He is the author of The Jasper’s Kitchen Cookbook. Chef Mirabile is a culinary instructor, a founding member of Slow Food Kansas City and a national board member of the American Institute of Wine and Food. He hosts a weekly radio show, “Live! From Jasper’s Kitchen” on KCMO 710 AM and 103.7 FM. Krebs began as a small coal-mining camp inhabited by the English, Irish and Italian miners. The commercial exploitation of coal in the Native American Territories began in 1872, with the completion of the Missouri, Kansas and Texas Railway. 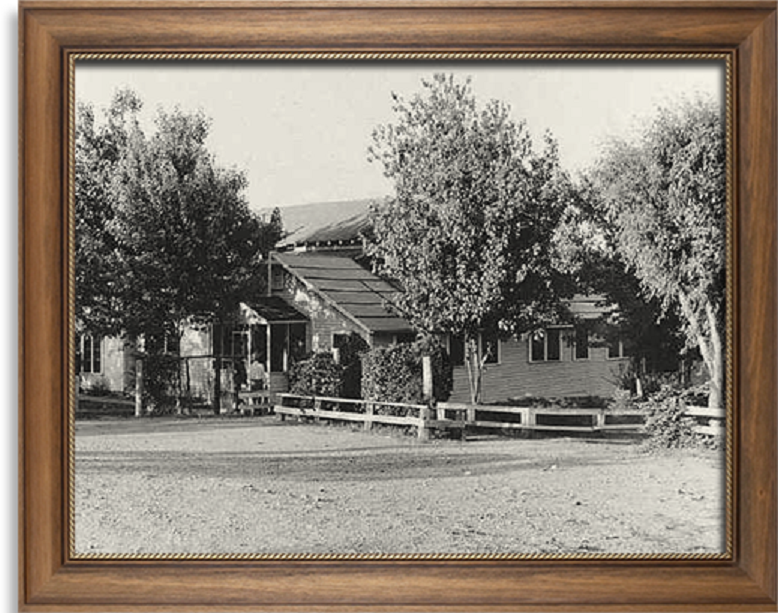 A few years later, the Osage Coal and Mining Company leased the property on which the town of Krebs emerged. The first mine opened in 1875 and twenty years later, 15 mines were operating in the area. 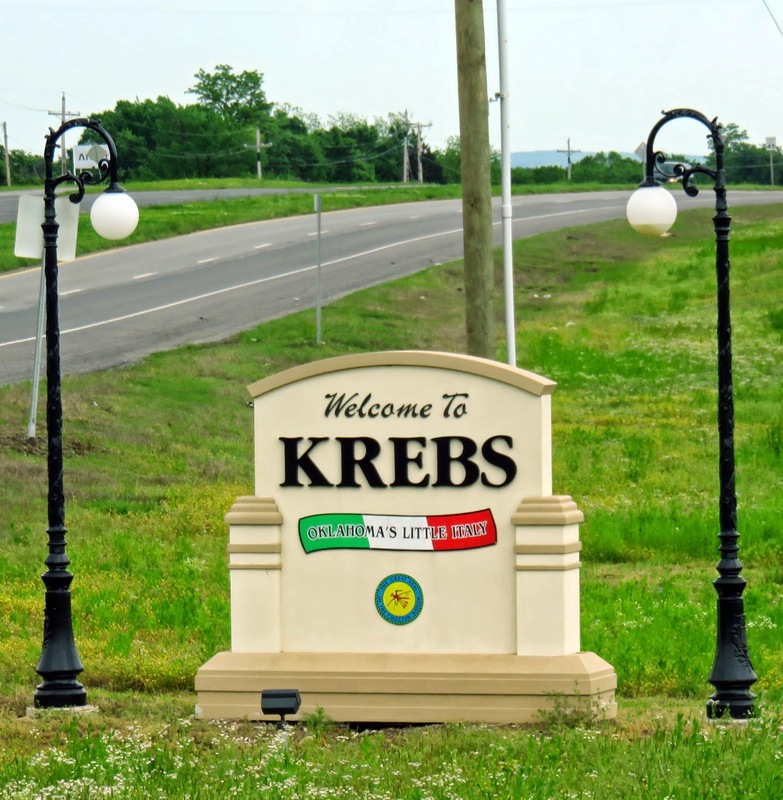 Krebs, Oklahoma is considered the center of Italian culture in the state of Oklahoma. Most of the immigrants who found their way to Oklahoma settled in the coal-producing communities in Pittsburg County and in the Choctaw Nation. Italian immigrants to Oklahoma were predominantly from northern Italy. They came as families and often established strong ethnic communities. In 1910, there were 2,162 Italians living in Pittsburg, Latimer and Coal counties. Later on the region attracted immigrants from southern Italy. First-generation Oklahomans learned Italian from their parents. There aren’t many first-generation Italian Americans left in Krebs. The language hasn’t made it down through the generations, but it can still be heard during festivals and community events, especially over a game of bocce ball. The Italian Festival has been running for 40 years and is the community’s biggest single event. When Kreps’ resident, Joe Prichard, took his family back to the Italian town his grandfather emigrated from, he was surprised by how familiar it felt. “The little village my grandfather left was almost a clone of the village he came to in Oklahoma,” he said. Joe discovered that San Gregorio Magno, in the Campania region, was not only the same size as Krebs, but community life there also centered around the Catholic Church. Even the town’s differences created parallels for him. Krebs is famous throughout Oklahoma for its many Italian restaurants. Isle of Capri, “Pete’s Place” and Roseanna’s, to name a few, have been there for generations. A specialty of the region is Lamb fries, the name generally given to lamb animelles (testicles) that have been peeled, rolled in cracker meal and fried. Lamb fries are served in many Italian restaurants, particularly in Oklahoma’s “little Italy” and the Cattlemen’s Steakhouse located in the Oklahoma City Stockyards. Three years after his arrival, at the age of 11, Pietro began working in the coal mines, changing his name officially to “Pete Prichard.” Through hard work and determination, he managed to make a meager living. However, in 1916, when Pete was 21 years old, a massive cave-in nearly cost him his life. He survived, but the accident crushed his leg in such a way that he couldn’t return to work in the mines. To help pass the time, Pete took an interest in brewing beer. He found a unique recipe brewed by the local Native American tribe, the Choctaw, which made use of the plentiful supply of golden wheat that grew on the Oklahoma plains. Pete experimented and tested until he perfected his own version, which he named choc® beer. Before long, other immigrant miners began gathering at his house regularly to relax and enjoy a beer during breaks. Then, it only seemed natural to start fixing the men a hearty lunch to go along with the beer. That’s the Italian way! He served “family-style” helpings of homemade Italian specialties like spaghetti, meatballs, ravioli and sausage. In 1925, Pete officially opened a restaurant in his home and, since everyone had always just called it “Pete’s Place®”, the name stuck. When Mike Lovera’s Grocery first opened in 1946 in Krebs, it was a regular mom-and-pop general store and meat market. But it was the homemade Italian sausage that made Lovera’s store stand out from the competition. A specialty Italian grocery store would find it hard to survive in most towns of 2,000 people. But Krebs has been largely Italian since immigrant coal miners arrived in the 1870s and the town has no problem supporting a grocery store, three Italian restaurants and a Catholic church. Along with about 40 imported Italian products, Lovera’s is famous for its caciocavallo, a milky cheese covered in wax. 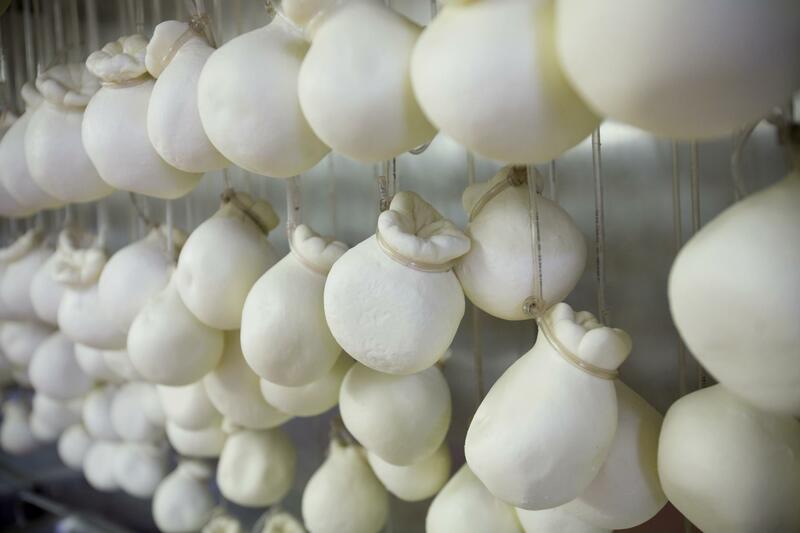 Initially, Lovera bought caciocavallo from local Italians who made it at home, but when the supply started to dry up, Lovera learned how to make it. Brush sausage with 1 tablespoon oil and place in a cast-iron skillet or small roasting pan. While the sausages are roasting, toss onions and peppers with remaining oil, salt and pepper in a mixing bowl. After 20 minutes in the oven, turn the sausages over and top with the onion-pepper-oil mixture. Roast another 20 minutes and remove the pan from the oven. 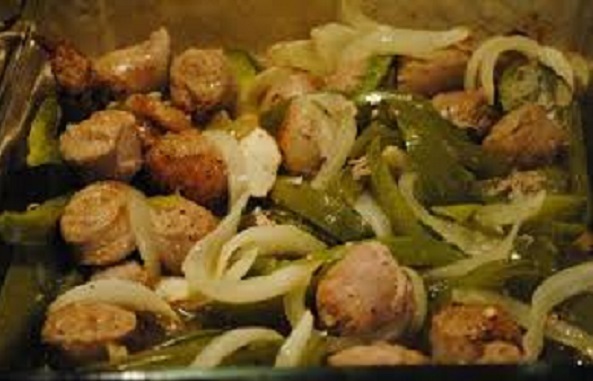 Remove the sausages from the pan, let sit five minutes, then cut in slices and toss with the onions and peppers in the pan. Serve with pasta and Italian tomato sauce or with crusty bread.